The Tramex WME Wood Moisture Encounter is a non-destructive moisture meter for Wood with attachment available for pin-type resistance probe measurement. Read non-destructively 30mm (1¼") deep in wood. Adjustment of specific gravity for wood species correction. Backlit display for easy viewing in low light conditions. Range of Plug-in handheld pin type wood probes for invasive testing (optional). Individual scales for precise readings in different wood species in pin-probe, resistance mode. Temperature adjustment capability for accurate pin-probe measurement. 1. Penilaian Anda Untuk Produk Ini? Pilih salah satu mata uang lainnya di bawah ini untuk melihat harga dalam mata uang yang berbeda. 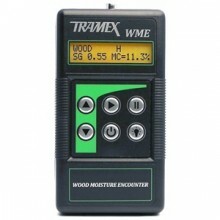 Klik tombol di bawah untuk menambahkan WME - Wood Moisture Encounter ke Daftar Keinginan Anda.